7.62x25mm Tokarev cartridge, with a brass case and FMJ bullet. The 7.62x25mm Tokarev cartridge is a bottle-necked pistol cartridge designed in the Soviet Union. It was widely used throughout the USSR and the Soviet satellite states. It is effectively a more powerful Soviet version of the 7.63x25 Mauser cartridge. It has been used in a variety of handguns, including the Soviet Tokarev TT-33 (and copies like the Romanian TTC) and the Czech ČZ vz 52. A number of submachine guns also used it. The Mauser C-96 pistol firing the 7.63x25mm Mauser cartridge became very popular world-wide after its 1895 invention. In 1908 the Tsarist Russian army began to allow its officers to purchase the Mauser C-96 to carry instead of the domestic Nagant M1895. After World War I and the Russian Revolution finally ended, the Soviet Army began to consider the Mauser cartridge. 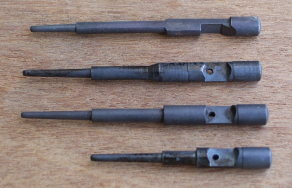 Soviet Artillery Committee decided on a variation of the Mauser cartridge with a number of minor variations. This was designated the Model 1930 7.62mm Pistol Cartridge. The two cartridges are physically very similar, to the point that many weapons can chamber both rounds. However, the significantly higher power of the 7.62x25mm Tokarev will likely lead to weapon damage and user injury. The Czech version is loaded to 25% higher pressure yet, leading to significantly higher velocity and energy and to greater danger if used in weapons not designed for it! The Czech ammunition must not be used in weapons not specifically designed for it! This case [the 7.62x25mm Tokarev] is very similar, except for the difference in length, to the .30 Mauser. 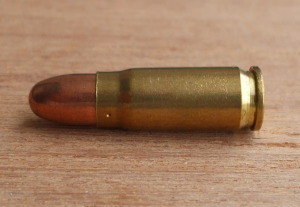 Due to higher operating pressures, if the .30 Mauser cases are fired with hotter 7.62x25 loads in the ČZ-52, it will tear the neck off some cases. 30 Mauser O.A.L. is .980" to .985" while 7.62x25 O.A.L. is .958" to .962". 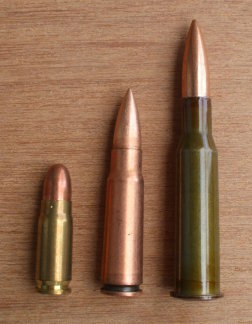 Here are three 7.62mm cartridges used by Warsaw Pact firearms: the 7.62x25mm Tokarev, the 7.62x39mm rifle cartridge used in the SKS 45 (Самозарядный карабин системы Симонова) and the AK-47 Калашникова rifles, and the 7.62x54R (rimmed) cartridge used in the Mosin-Nagant rifle (Винтовка Мосина). Also compare the 7.62x25mm Tokarev to some other common handgun cartridges. Users commonly report that the recoil, report, and muzzle flash of a 7.62x25mm Tokarev cartridge are similar to those of a .357 SIG. The unusually loud report and prominent muzzle flash can be surprising to the unprepared shooter. This round can perform more like a small rifle cartridge than a typical pistol cartridge. Bullet Diameter 7.8 mm 0.31"
Neck Diameter 8.4 mm 0.33"
Shoulder Diameter 9.4 mm 0.37"
Base Diameter 9.7 mm 0.38"
Rim Diameter 9.9 mm 0.39"
Rim Thickness 1.3 mm 0.051"
Case Length 25 mm 0.98"
The so-called "Czech Load" is suitable for use only in handguns specially designed for the higher pressure such as the ČZ-52. However, is the ČZ-52 really that much stronger than other 7.62x25mm handguns? Dimensional measurements do not support this frequently made claim. Click here for some speculation on the ČZ-52's relative strength. Some reloading experimenters have custom-loaded 7.62x25mm cartridges with sabot rounds using 3.6 gram (55 grain) .22 caliber bullets, obtaining rifle-like muzzle velocities in excess of 670 m/s (2200 ft/s). That would correspond to kinetic energy of 808 J (601 ft-lb). 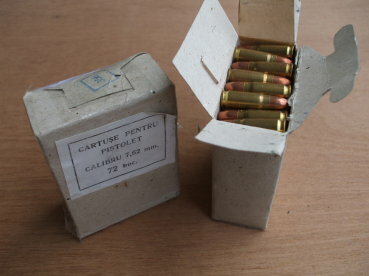 Typical packaging of Romanian 7.62x25mm Tokarev cartridges. Headstamp of Romanian 7.62x25mm Tokarev cartridge. "22 / 83" in this case. 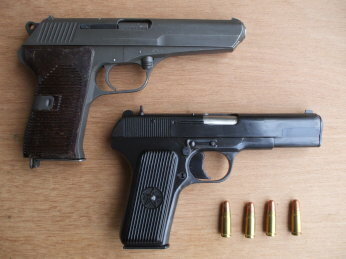 ČZ-52 and TT-33 (Romanian TTC) 7.62x25mm pistols. The Czech ČZ-52, of course! Soviet ТТ-30, 7,62-mm самозарядный пистолет Токарев образца 1930 года or 7.62mm Samozarjadnyj Pistolet Tokareva obraztsa 1930 goda, or "7.62mm Self-loading Pistol 'Tokarev' in the model of the year 1930", slightly modified into the ТТ-33 and still being manufactured with further modifications by Norinco. Romania manufactured a copy of the TT-33 known as the TTC or Cugir Tokarov. Russian ОЦ-27 Бердиш or OTs-27 Berdysh (NATO designator: "Pole-Axe"), developed in the early 1990s to replace the standard Makarov PM service pistol in service with the Russian Armed Forces. Soviet PPD-40, Пистолет-Пулемет Дегтярева, Pistolet-Pulemyot Degtyaryova or "Degtyaryova Machine Pistol", designed by Vasily Degtyaryov in 1934 as a near-copy of the German MP28. Soviet PPSh-41, Пистолет-Пулемет Шпагина, Pistolet-Pulemyot Shpagina, or "Sphagina Machine Pistol", designed by Georgi Shpagin in 1941 as an inexpensive produced and easily maintained alternative to the PPD-40. Soviet PPS-43, Пистолет-Пулемет Судаева, Pistolet-Pulemyot Sudayeva, or "Sudayeva Machine Pistol", even simpler than the PPSh-41.